Photo courtesy of National Forest Service The Halstead Fire burns in a stand of live and beetle-killed timber north of Stanley last August. The Enclosure Fire may not have been the largest of the region’s wildfires in 2012, but it may have been the eeriest. On the eve of the anniversary of the 2007 Castle Rock Fire, a human-caused wildfire flared up southwest of Ketchum, causing some to fear for their houses and property. The fire was reported at 3 p.m. on Thursday, Aug. 16—five years to the day, almost to the hour, that the 48,000-acre Castle Rock Fire was reported to have started, and roughly in the same area. The fire started on a ridge between the Red Warrior and North Fork of Deer Creek drainages. Forest Service officials originally estimated the fire’s size at 250 acres, then 350, before GPS mapping on Saturday, Aug. 18, set it at 179 acres burned. Ketchum District Ranger Kurt Nelson said at the time that a major concern was the amount of fuel available to the fire if it were to spread far enough south toward Hailey. “If we had shifting winds that came out of the west or northwest, [the fire] had the potential to go into heavy fuels and timber in the Deer Creek drainage and wrap around to Greenhorn and Deer Creek [neighborhoods],” Nelson said. Firefighters and equipment from the Ketchum, Hailey, Sun Valley and Bellevue fire departments, as well as crews from Wood River Fire & Rescue, formed a “structure protection task force” on Thursday night. No homes or property were damaged. Nelson said the fire never came closer than three miles to private property in the Frenchman’s Bend area of Warm Springs, five miles from private land in Greenhorn and six miles from the top of Bald Mountain. Early investigation showed that the fire was human-caused, based on factors that Nelson said include the point of ignition and the lack of anything else that can be pinpointed specifically, such as a tree that could have been struck by lightning. Nelson said on Dec. 26 that the investigation is still ongoing, but that the law enforcement branch of the U.S. Forest Service has informed him the fire was not set intentionally—despite a statement by Ketchum Mayor Randy Hall at a Ketchum City Council meeting on Aug. 20. “It’s sad that there was someone running around trying to re-create one of our community’s most challenging times on the event’s fifth anniversary,” he said. The Halstead Fire near Stanley also came close to home for many, especially for outfitters who have base operations around the Salmon River. The Halstead Fire burned three miles north of Stanley and grew to 179,305 acres by the end of September, threatening Cape Horn and Stanley creeks, as well as state Highway 75, U.S. Highway 21 and the Yankee Fork area. However, river outfitters said they were undeterred by the smoke in the air, and Sawtooth National Recreation Area officials allowed them to float the Salmon despite its closure to other recreationists. Though smoke blanketed the Wood River Valley, including Ketchum and Hailey—prompting air quality advisories for several consecutive weeks—Stanley residents said the air was clear where they were. 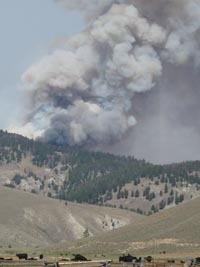 The Wood River Valley also experienced smoke from the Trinity Ridge Fire near Featherville and from the Mustang Complex Fire west of the town of Salmon, both of which burned through July and August. Trinity Ridge was contained in September after burning 145,696 acres. The Mustang Complex Fire reached 338,319 acres before holding steady.